E-shops, media, financial institutions, and many others need online payment tools and custom-made calculators on their websites. 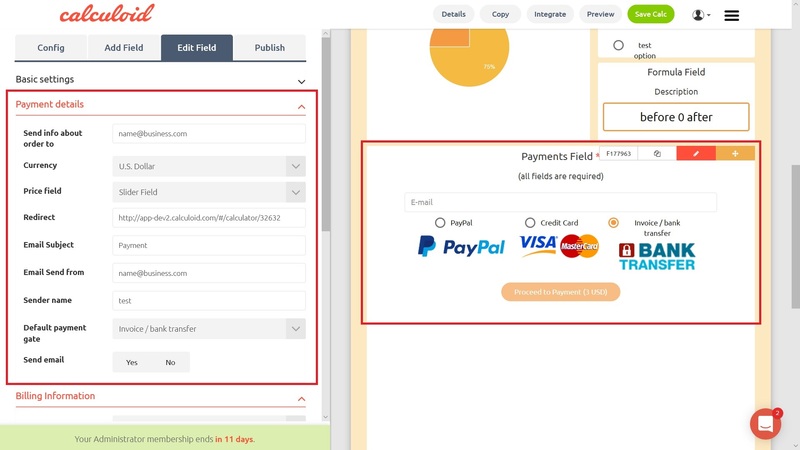 The requirements are clear: Customers want a simple, user-friendly tool that can easily be linked to an electronic PayPal and Stripe account. This is exactly what our online payment platform Calculoid offers. What's new in the latest version that heads the US market? Calculoid is a user-friendly tool that will allow you to create a web calculator with a price calculation and a payment gateway within half an hour without the website owner having to deal with any programming. He only chooses one of the preset templates and creates an online calculator tailored to suit his needs. In version 2019, Calcoid supports recurrent payments, a new mobile design, and allows the first two weeks to use all of the features for free. Six basic Calculoid templates allow you to create a cost calculator, return on investment calculator, calculator for insurance, loans and credits calculation, project cost optimization calculator, cost savings calculator, and online shop. Our solution is used, for example, by world-renowned blogger Anna Victoria for protein calculation on her blog on fitness and healthy nutrition. Very popular is Calculoid mainly in financial services such as insurance, loans, mortgages, etc. With Calculoid.com platform, we focus primarily on the US and Canadian markets, where Calculoid meets the highest demand - currently has over 20,000 users on the US, Canadian and British markets and their number is steadily growing. In the future, we would also like to launch the Czech localized version, we expect to integrate GoPay and PayU - the largest Czech online payment aggregators - and also Global Payments for the EU. Details of the current version of Calculoid, including sample templates and promotions, can be found on website www.calculoid.com. © 2017 Easy Software Ltd.